Forechecking: Your Dallas Stars Ended 2017 Properly! Have Your 2017-2018 Dallas Stars Finally Figured Things Out? After Earning Four Out Of A Possible Six Points Last Week, We Kinda Think So! Your Dallas Stars sure did end the calendar year with excitement and intrigue, earning four out of six points against very difficult opponents and in a wide range of situations. Even better? It would appear that the franchise has much to look forward to in the future, too. Because not only is current roster starting to gel together, but six Stars prospects are being featured heavily in the World Juniors, most notably American goaltender (and hopefully future Dallas Stars ace) Jake Oettinger. Yes, there is much to look forward to in 2018 and beyond. But let’s first look back on the week that was and what this coming week will bring. • Darkness Music at Minnesota Wild, 2-4. Coach Ken Hitchcock began the game with line combinations that we’ve never seen before, then left Minnesota speaking of “poor effort” as Dallas was unable to cash in late in this sloppy post-Christmas tilt. Trailing Minnesota 3-2 entering the third period, the Dallas power play was simply unable to convert for the tying goal. Then they succumbed to an empty-netter in a last-ditch effort in the dying minutes of the game. Jamie Benn picked up an assist to inch his was up the all-time Dallas Stars point total leaderboard, passing Sergei Zubov at 550. Now, he’s second only to Mike Modano’s gaudy 1050. Will “Chubbs” catch Mikey Mo one day? Only time will tell. • Victory Green™ versus St. Louis Blues 4-2. With the Stars directly trailing the St. Louis Blues in the standings and not having much luck against them this season, this come-from-behind Victory Green™ just might be a game that fans can look back at and recall as the moment when Your 2017-2018 Dallas Stars finally started to figure things out. After notching the game’s first goal in the second period on a wonderful pass from Jason Spezza to Mattias Janmark, the Blues aggressively countered with two of their own in the third period that had us slumping in our lawn chairs at another blown lead late in the game. But then the Stars’ power play finally struck and re-energized the AAC — and Stars fans everywhere — just 14 seconds into the man advantage with Alexander Radulov sniping a wrister past Jake Allen. In typical Radulov fashion, his goal celebration (or celly as kids call it) was a thing of beauty as he purposely drifted passed fellow countryman Vladimir Tarasenko on the Blues’ bench. He then potted an empty netter moments later to secure the comeback win in thrilling fashion. • Victory Green™ versus San Jose Sharks, 6-0. On a day when the Dallas Cowboys finished their season with a 6-0 victory over the Eagles, Your Dallas Stars matched Da Boys’ offensive output with six points of their own. Has that ever happened before? We don’t know! But what we do know is that the Sharks were clearly out of their depth as soon as the puck dropped in this New Year’s Eve tradition. The good: The Stars’ powerplay is starting to heat up after slumping last month; Ben Bishop stopped all 26 shots for his fourth shutout, tying him for the NHL lead in that category; and John Klingberg scored and continued to lead all NHL defenseman with 33 points. The bad: Alexander Radulov was upended on a partial breakaway and then slammed into the endboards, laying prone for several minutes. When seeing this, we honestly thought Rads was playing it up a bit to potentially draw a call, but he did not return to the game. Fortunately, he is listed as active and ready to go against the Blue Jackets tonight. 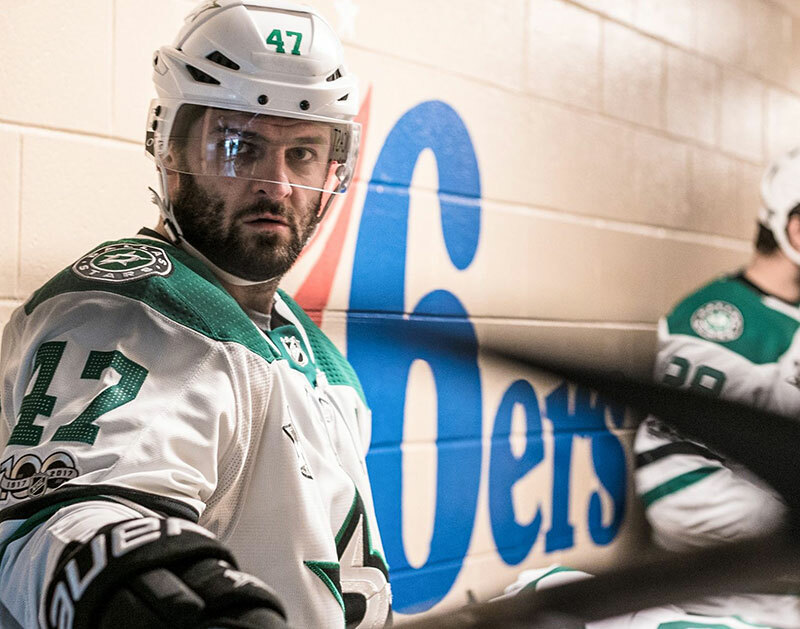 Alexander Radulov is the most fun player we’ve seen in Victory Green™ since… well, since Victory Green™ was invented. His infectious style and personality clearly ignites his teammates, and his workhorse mentality is evident in every toothless shift he provides. Last year in Montreal, Rads posted 18 goals and 54 points in 76 games, which was good for second in scoring on that team. This season, he already has 14 goals in 40 games this season, which is a testament not only to Radulov’s commitment to earning his big contract, but also to how well he’s meshed with his new teammates, regardless of which line Hitch slots him on. Lost in all of the Russian’s heroics is his play along the boards. In last night’s thumping of the Sharks, Radulov smartly threw a behind-the-back, between-legs pass while getting stapled to the glass. It was a play that won’t show up in the highlights, but one that did allow the Stars to clear the zone and lead the rush into the opposition’s end. These are the little things that separate the razor-thin margin of playoff teams from the non-contenders, and we are sure as hell glad to have #47 in for the long haul. Thankfully, his days of concussing his teammates are over. Columbus Blue Jackets at Dallas Stars. Tuesday, January 2, at 7:30 p.m. The Stars’ extended home stand continues with the slumping Blue Jackets visiting the AAC — and possibly scouting Jason Spezza???? OMGZ. New Jersey Devils at Dallas Stars. Thursday, January 4, at 7:30 p.m.
After having posted an 8-4-2 record in the month of December, the Devils are somehow one of the top teams in the Eastern Conference standings. That’s cool, we guess. But seeing Tyler Seguin squaring off against Taylor Hall once again is what I’m most looking forward to, TBH. Saturday, January 6, at 2 p.m.
Connor McDavid is doing the best he can on — gasp! — yet another underachieving Oilers squad. Some things never change, SMDH. Previous ArticleBar Raised: Dallas Spent $67 Million On Booze In November. Next ArticleThings To Do In Dallas On Wednesday, January 3.